March 10: Are You Spiritually Healthy? So let me ask you a question: Are you healthy? And when I ask that question, what do you think about? You probably think about physical health, right? “OK, how healthy am I physically?” and, “How’s my blood pressure?” and, “How’s my cholesterol?” and . . . these sorts things. But are you spiritually healthy? It’s interesting, I think we almost never talk about it. We talk a lot about the health of the body, which, lets face it, at some point is going to be just buried in the ground, and that’ll be that. But the soul lives on forever, and we almost never talk about soul health. We almost never talk about spiritual health. One of the things that Dynamic Catholic is all about, one of the things that this program is all about, is helping people become spiritually healthy—or healthier. Do you know when you are spiritually healthy? Can you tell that some days you’re spiritually healthier than other days? Because that’s the kind of awareness that God wants to give us. I think we can tell some days we’re physically healthier than other days. God wants us to have that same sort of perspective on our soul, on our spiritual health. One of our reasons for the obsession with the physical over the spiritual is because of the immediate impact the neglect of our physicality has. If you don’t eat, you die in a few days. You don’t breathe, you die even quicker. And so we are obsessed, in some ways, with the physical because there are very dire consequences to ignoring the physical realities of the human person. But we do have these spiritual realities as well, and they play out in different ways. And when we do become spiritually unhealthy, I think one of the things is that it distorts our personality. It distorts our personality in ways that affects us from doing what God’s called us to do, being the person God created us to be, and from relating with other people in healthy ways. If you look at your day yesterday, did you spend most of your time on the things that matter most, or did you get distracted by a million little things that don’t really mean anything to anyone that significant? It happens to us all the time. And not just a day, you could go a whole week and then look back and think, “Wow, I didn’t really do anything important this week. I didn’t really spend any time on the things that matter most this week.” And worse than that, it could be a month, or it could be a year. The answers to these questions take a long time to develop. And one of the ways we develop them is through this daily habit of prayer. 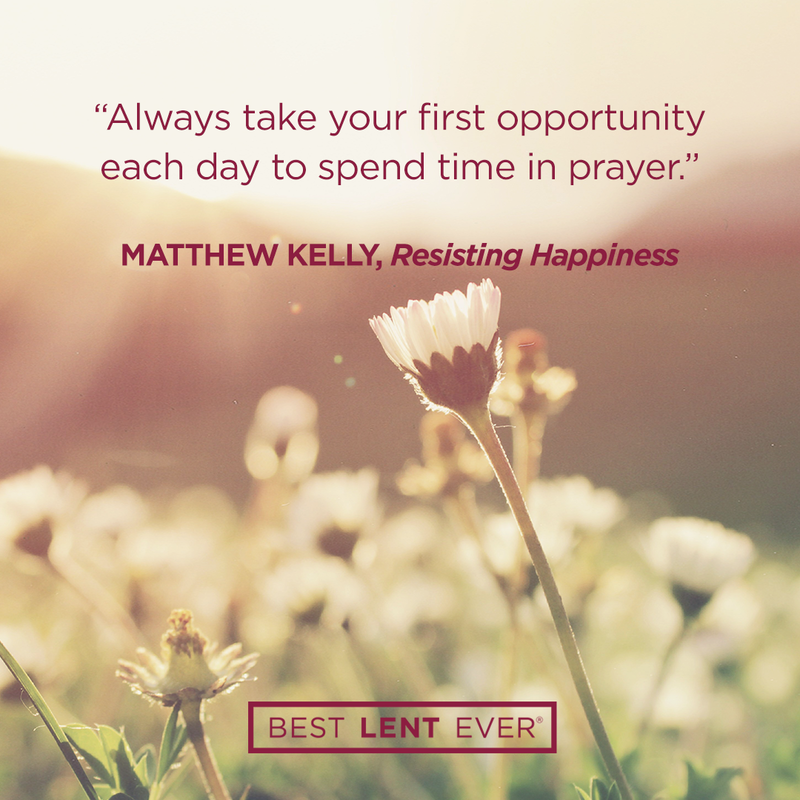 Yes, we’re resistant to establishing this daily habit of prayer. But by establishing a daily habit of prayer, a few minutes each day, 10 minutes a day . . .
For 25 years I’ve been encouraging people to spend 10 minutes a day in prayer. By establishing this daily habit of prayer, God will, very powerfully, answer those four questions. He will show you who you are, and what you’re here for, and what matters most and what matters least. God wants to bless you with spiritual vitality. Significant Moments: Identify something you experienced in the last 24 hours and explore what God might be trying to say to you through that event (or person). Today’s personal reflection features Dynamic Catholic team member Matt Scherr. Matt is one of our major gift officers, coming to us from Buffalo, New York. Matt achieved a black belt in tae kwan do when he was 12 years old, is a long-suffering Buffalo Bills fan, has played guitar for 15 years, and really wants a puppy. How do your best days start?